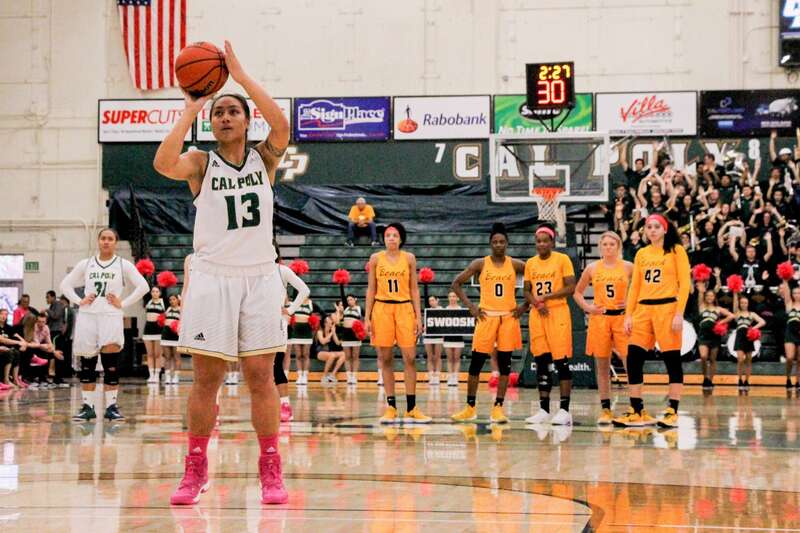 Cal Poly women’s basketball bounced back from Thursday’s loss to UC Davis by defeating Long Beach State 70-61 Saturday afternoon in Mott Athletics Center. With the win, the Mustangs (14-9, 8-3) remained in third place in the Big West Conference standings while Long Beach State (3-21,1-9) remained in last place. Senior guard Dynn Leaupepe moved into third on Cal Poly’s all-time scoring list with her first basket of the game early in the first quarter, finishing the game with a team-high 17 points along with a game-high nine rebounds, five assists and three steals. “It’s very humbling and I’m very blessed to be able to be mentioned in the top three in Cal Poly history, so I think I’m just going to keep working hard and go wherever the wind takes me,” Leaupepe said. The Mustangs trailed 20-11 at the end of the first quarter as the 49ers sank five of eight three-point attempts while the Mustangs made only one out of their seven three-point attempts. Cal Poly’s cold shooting continued through the first half as they were held to 28 percent shooting from the floor before halftime. With just more than two minutes remaining in the second half, a flagrant foul by Long Beach gave the Mustangs momentum as Leaupepe sank the two penalty free throws. This sparked the Mustangs on a 7-3 run to close out the half with a 28-27 lead. When leading at halftime this season, Cal Poly is 11-1. Freshman guard Ayzhiana Basallo provided an offensive spark for the Mustangs off the bench, scoring five of her eight points in the beginning of the third quarter. After Long Beach closed it to a 49-48 Mustang lead, Cal Poly went on a 9-2 run to take a 58-50 lead with five minutes remaining. From there, the Mustangs kept the 49ers at a distance and closed out the game with a win. Both Leaupepe sisters moved up the leaderboard for career scoring in school history, with Dynn (1,517) going from No. 4 to No. 3 and senior forward Lynn Leaupepe (981) from No. 18 to No. 16. Cal Poly will travel to take on UC Irvine Thursday with tip-off at 5:30 p.m.